Allergen Statements / Claims TANGY ORANGE • NATURAL & ARTIFICIAL FLAVOR • Gluten Free, Sugar Free. Other Ingredients Natural & Artificial Flavors, Citric Acid, Malic Acid, Sucralose, Acesulfame Potassium, Soy Oil & Lecithin Blend, Calcium Silicate, Shellac, FD&C Yellow #6, Hydroxypropyl Methylcellulose, Sorbitol, Glycerin, Acetylated Monoglycerides, Polysorbate 80, Potassium Sorbate, Magnesium Silicate Hydroxide. Contains: Soybeans. 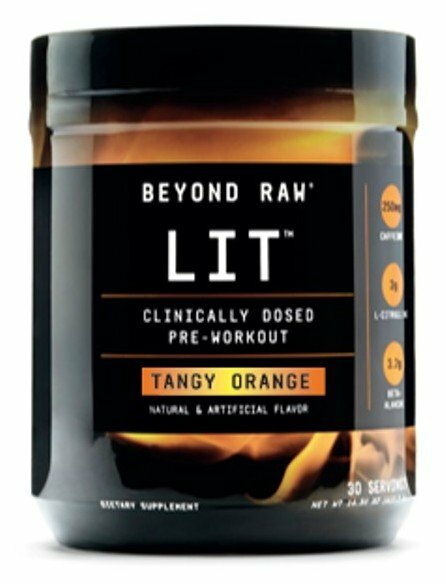 Serving Directions As a dietary supplement, mix one scoop in 8 fl.oz. of cold water and consume pre-workout. On non-training days, consume one serving for additional energy and focus. * Consume ample amounts of water while taking this product. Do not take near bedtime.